Lap cats are born not made. True? Well, it is true that heredity has a lot to say about a cat’s personality. Friendly mother cats tend to raise friendly kittens. We’re not sure, though, if the kittens are simply modeling Mom’s behavior or if their personality is passed on genetically: Kittens are also more likely to be friendly if Daddy is friendly and social, even if he doesn’t have anything to do with raising them. 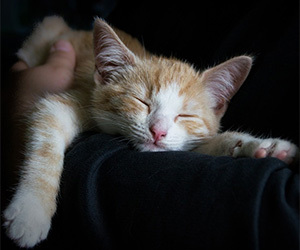 Early handling by humans is also an important part of how a kitten’s personality develops. Kittens between the ages of 3 and 7 weeks who receive positive physical handling and attention from people tend to be friendly and social. But what if you don’t know about your cat’s early experiences and influences, and you’d just like him to spend more time in your lap? Can you train him to be a lap cat? You can sure try, and I have five tips that may help you succeed. Keep calm. Cats feel threatened by sudden movements and aggressive actions. Move slowly around him so he has time to get used to your presence. Even if you’ve been living together for a while, he’ll appreciate your newly feline manners. Don’t stare at him. Cats appear to think that’s really rude and won’t want to interact with you. Instead, slowly blink your eyes at him. There’s a good chance your cat will respond with the same slow blink. It’s a kind of kitty kiss without all the touchy-feely stuff. Rub him the right way. Cats are purr-ticular about where and how they like to be touched. Scratch them between the ears or beneath the chin, rub that sweet spot between the eyes or stroke them along the spine. Avoid the belly and the base of the tail. Many cats feel vulnerable when their tummy is at risk, even if you’re not a threat to them. And while they like to scent us with the glands on their head and face, they don’t love it so much when we pick up the odor from their tail glands. It may be that the glands at the base of the tail have specific uses or meanings to cats and that their perfume isn’t meant for us. Bond through beauty. Grooming your cat is another way to build a relationship with him. Cats love to groom themselves and each other. It’s a social thing. Your cat will probably enjoy it if you brush him in a slow, gentle, rhythmic motion, all the while talking to him in a soft voice. Watch your cat’s body language to make sure he’s enjoying your attention. If his tail starts to twitch — or if he simply gets up and walks away — he’s had enough. Bribery works, too. Carry around some nice, soft, stinky cat treats wherever you go. Reward your cat whenever he approaches you for some loving or settles in next to you or on your lap. Be careful not to force petting on your cat. A recent study found that cats who reluctantly allow people to stroke them are more stressed than cats who simply avoid being petted. Instead, be patient, and your cat may begin to invite your attention by jumping into your lap, rolling over in front of you or presenting you with the area he wants to be stroked. If he does, appreciate his invitation to engage in a mutually beneficial social ritual.